Born in Brooklyn, New York, Mr. Fiumara graduated from Rutgers University with a B.A., Phi Beta Kappa. He received a Master’s Degree in City Planning from the University of Pennsylvania in Philadelphia. Later, he earned his Law Degree from the Rutgers University School of Law, Camden, 1989. Mr. Fiumara has been practicing primarily in the areas of Criminal Law, Personal Injury, Land Use and Zoning and general Civil Litigation for the past 22 years since 1992 in Sonoma and Marin Counties. In 2014, Mr. Fiumara was inducted into the National Top 100 Trial Lawyers. Hence, Mr. Fiumara is very familiar with the local Sonoma County and Marin County Judges, court procedures and the way to get things done on your behalf. Mr. Fiumara takes a great deal of pride in working together with the local courts, the prosecution, probation and program providers to tailor alternatives to jail and/or prison. Please also see our section on: alternatives to jail. Mr. Fiumara has been known to team up with the best litigators to make sure that you have all of the resources that you need to win your case and get an acquittal. 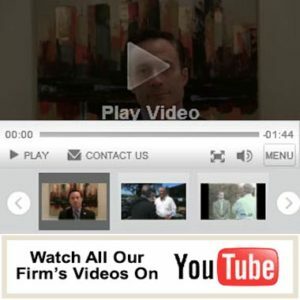 Strategy and winning pre-trial motions from the very beginning is the first line of defense. In the very least, Mr. Fiumara has a good track record of reducing an accused person’s fines and reducing charges from felonies to misdemeanors. Mr. Fiumara has also worked to set aside and expunge felonies and misdemeanors so that defendants can get a new start on life. Mr. Fiumara has been practicing personal injury law as long as he has practiced criminal defense. However, prior to moving to Sonoma County, Mr. Fiumara had the distinction of working with a well-respected San Francisco boutique insurance defense law firm in the financial district. There he gained very valuable insight on how the insurance industry values and defends claims. With this experience, Mr. Fiumara has been very effective at settling personal injury claims often without the need to litigate, thus saving the aggrieved and injured plaintiff time and expense. But, when litigation is required to obtain a fair monetary award, Mr. Fiumara and his team of investigators and litigators go all out and pull no stops. Please see recent settlement under “Personal Injury” section. Mr. Fiumara has the unique distinction in this County of not only possessing a Law Degree, but he has earned a separate Master’s Degree in City Planning from one of the best Ivy League Schools in the Country, the University of Pennsylvania in Philadelphia. Before practicing law, his second career, Mr. Fiumara had more than 15 years of land use, zoning and government work experience. He worked for the infamous New York City Mayor Edward Koch in the Office of Management and Budget (OMB). If you can work for Mayor Koch and survive in New York City at the same time, you can thrive anywhere else! Later, the City of Newark, New Jersey hired Mr. Fiumara as their Senior Comprehensive Planner for the City. He stayed in that position until he began law school at Rutgers University in New Jersey because he wanted to be further challenged. Mr. Fiumara also gained insightful and valuable land use experience when he served as a tremendously active planning board member in the rapidly growing Philadelphia suburb of Voorhees, New Jersey. There he worked with planners, developers, politicians and individual property owners to develop and implement a master plan and site design review plan. In Philadelphia, while a graduate student at the University of Pennsylvania, Mr. Fiumara worked in the City’s Gift Property Program where he worked with a wide variety of community groups and nonprofit organizations to help improve the City’s housing stock. Mr. Fiumara has had the unique experience of having been employed by the Santa Rosa City School District as an outreach leader and liaison for the students, particularly Latino and minority students. This experience enables Mr. Fiumara to understand how School Districts respond to student discipline and other safety concerns on campus. As a result, Mr. Fiumara has represented dozens of students against overzealous “zero tolerance” School District policies for infractions and violations relating to the Education Code. Mr. Fiumara has represented dozens of students in disciplinary hearings before administrative panels and school boards. Many times students have been denied their due process rights by inflexible disciplinary codes that use catch all categories like “insubordination and disrespect” to mandate suspension or expulsion. Often times, the Education Code has little regard for the circumstances or nature of the offense, or the student’s history. Mr. Fiumara’s strong advocacy on behalf of his clients has been covered by the PacificSun, The Santa Rosa Press Democrat and The San Francisco Daily Journal. Copies of these articles will be furnished upon request. Mr. Fiumara has challenged expulsion proceedings which violate students’ rights due to violation of their due process rights, and has worked with other counsel around the State to expunge school board policies (see the San Francisco Daily Journal, Wednesday, November 20, 2002, front page story “Class Actions-Do Expulsion Proceedings Violate Students’ Due Process Rights? Lawyers Defending Several Young Men Argue That They Do”). Mr. Fiumara has appeared before many local and Bay Area School Boards representing students in expulsion hearings. He has been successful at working out arrangements to avoid the harsh effects of expulsion. Instead of expulsion, Mr. Fiumara has negotiated reasonable suspension/expulsion terms and conditions which allow the students back into the classroom while at the same time protecting the student’s school record. Often times the student’s cumulative school file and school records are incorrect or include information that could be potentially harmful. Mr. Fiumara has successfully used the Education Code to remove erroneous records, comments and other harmful information from the student’s cumulative and other school files. -Teamster Attorney for DUI and misdemeanor cases representing UPS employees and Truck Drivers. -Mr. Fiumara served for over a decade as President and Board Member on the Santa Rosa Democratic Club, fundraising and served as an Alternate on the Sonoma County Central Committee.